Looks like a duck, but squeaks! This deluxe plush dog toy has been created with the sporting dog in mind. There is no way this Mallard will escape your dog . 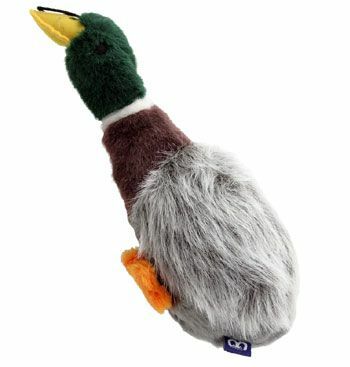 With each squeeze this toy squeaks to keep your hunting companion interested and busy with his new toy. This is a perfect gift for puppies, as well as any dog who enjoys the field. GREAT gift idea for the dog that has it all! Thank you for your assistance in this regard. Your company has been a pleasure doing business with - very prompt, good communications. I will not hesitate to tell my friends about your site as well as... -Again, thanks. Donna C.